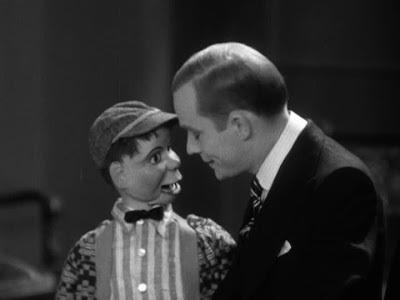 THE OFFICE SCANDAL (1931) --- Charlie McCarthy blackmails Edgar Bergen into giving him an office job, a conceit I bought as it always seemed the dummy had the ventriloquist over a barrel, onscreen and off. Also noticed this time that Edgar avoids looking at Charlie when the latter speaks. Would such direct engagement psych EB out? It must have been difficult for Bergen to give over his personality and comedy to this inanimate thing, which was all Charlie was, even though it seems more appropriate that Edgar rather than the dummy be put back in a closet or storage box at the end of their working day. There's a Dead Of Night vibe between the two I always find compelling, as if Bergen might someday rebel against McCarthy, with the question being which will destroy the other. Was the fact Charlie had his own bedroom in the Bergen household mere publicity, or a real-life necessity that Edgar had to accommodate? Did Candice fear Dad's creation walking into her room under its own steam? Well, I'm drifting off topic here --- The Office Scandal was, according to authority, the team's second Vitaphone subject (of twelve), and is available among Warner Archives' Volume Two of Vita-treats. To say I recommend them would be understating. All are fabulous. 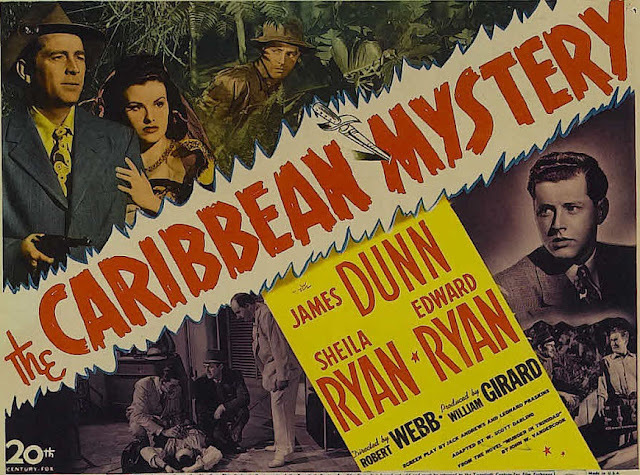 THE CARIBBEAN MYSTERY (1945) --- Actor James Dunn had been a meaningful name at the old Fox Film Corp during the early 30's, diminished later by a drink habit that took him to B's, minor support by the 40's, and inroads of age. 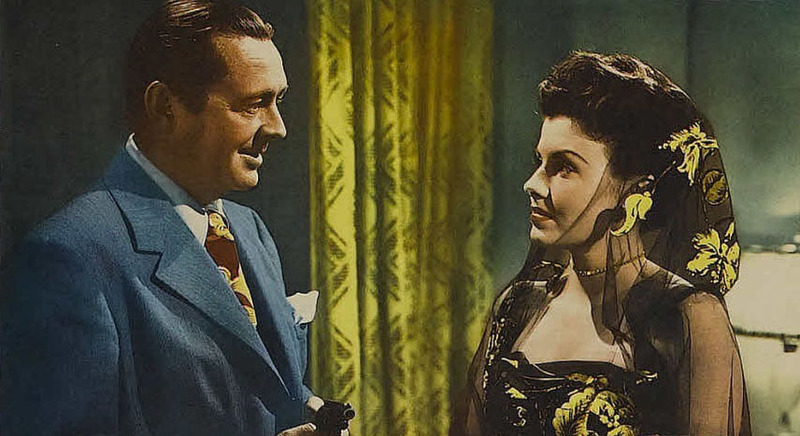 Making most of another down-billed part, this time in prestigious A Tree Grows In Brooklyn, won JD an Academy "Best Supporting" nod and briefly put him back front-running in a vehicle not unlike ones of hale and hearty peak. The Caribbean Mystery was a Fox property done twice already, their own Maltese Falcon as it were, always good for a remake (even Mr. Moto had a crack at the yarn). Indoor swamp-set, with backlot sweetening, The Caribbean Mystery goes through paces (reasonably fleet ones at 64 minutes) and gives transplanted Brooklyn detective Dunn room to breathe. This was also Sheila Ryan's last under 20th pact, a fact cruelly apparent for the abrupt and perfunctory exit given her character here. The "mystery" isn't too mysterious, but Fox trappings are lush, and adherents of their Chan/Moto groups will find much to enjoy. Perhaps a Dunn detecting series was momentarily considered, but The Caribbean Mystery took a loss ($18K), thus the one-shot. Fox's On-Demand DVD is a stunner --- one of their best jobs so far. LADIES LOVE BRUTES (1930) --- At-peak George Bancroft was predictably about two things: winning at work and losing at love. He was like Lon Chaney to that extent, a last reel death or sacrifice trumping hopes he'll get the girl. Paramount frankly ran Bancroft's roughneck persona into pavements he trod, the actor's modern caveman never even slightly varied. Finally, they'd let him drift when GB wanted more dough --- how could he realize the well had been drained? (finding out led to mostly support parts from there on). 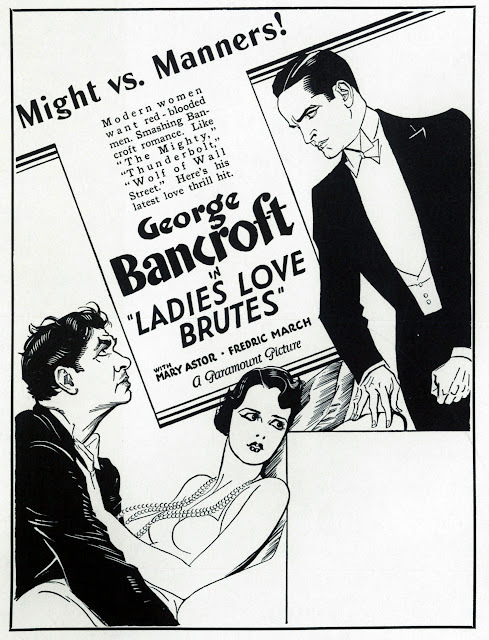 Ladies Love Brutes was at least a muscular title, but patronage must have known precisely what they'd get for it and Bancroft's name on marquees. He's a "skyscraper king" questing for ritz-class acceptance and the icy hand of socialite Mary Astor, a biggest mistake imagining he'll get above modest raisings. Movies disdained upward mobility. Good seldom came of it. Much of this, I'd guess, was persuading watchers to be satisfied with their lot, whatever that amounted to. Bancroft forgets his, and disaster results. Was this part of how Depression industry helped avert social revolution threatening a down-and-out nation? THE SCARLET BLADE (1964) --- Hammer pits ruthless Roundheads against forces of Prince Charles I in costumed departure from horrors the Brit firm was better known for. Faces here are Hammer ones we know, so a genre switch goes down easier, and what matter if Michael Ripper plays here a gypsy rebel rather than his customary bar man or grave despoiler? Oliver Reed comes on like Olivier in first flowering and steals the pic wholesale. In fact, US distributing Columbia altered the title to The Crimson Blade, for greater promise of blood perhaps? Action isn't generous, veering loyalties and in/outing from secret passages being much of what we get, but it's paced quick, intelligently writ, and well played by all. Hammer sword-and-sash should have gotten a better break in the colonies, but guess we were too busy looking to a next Frankenstein or Mummy installment from them (I know I was). This was a Region 2 DVD from the UK of excellent quality. 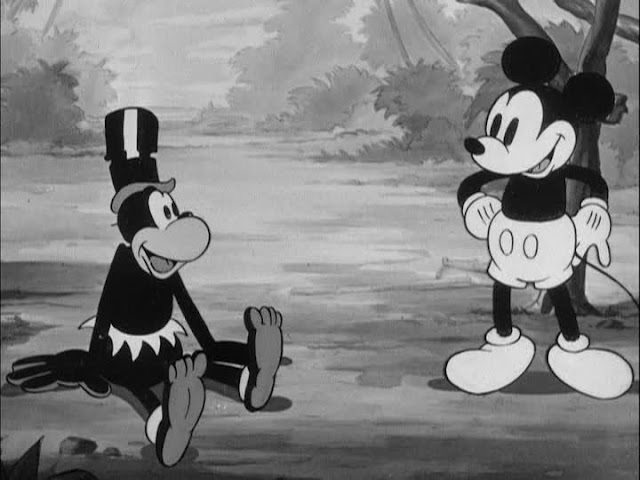 MICKEY'S MAN FRIDAY (1935) --- How did story guys and gagsters come up with a next Mickey Mouse? Maybe they'd been to see Doug Fairbanks in Mr. Robinson Crusoe, for this cartoon is a near photo-finish of that. Mickey had channeled Doug before, in swashbuckling mode. The Mouse could adapt himself to action personas of live action colleagues, that chameleon quality keeping his act fresh through a first decade and unparalleled popularity. 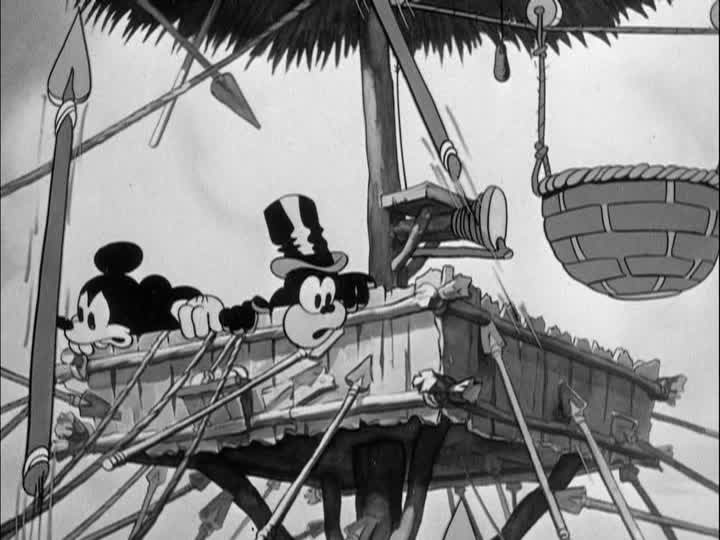 Disney scribes were copied as well, Mickey in costume scaring the natives being redone by Clark Gable at a pivotal moment of 1938's Too Hot To Handle. The Crusoe theme was easy pickings for Disney in any event, being pre-sold in terms of audience familiarity and providing more than enough to flesh out eight animated minutes. Disney could also put real spectacle into cartoons, mass action with drawn extras by a score being proof that his artists applied greater effort as matter of routine. Mickey's Man Friday came late in the Mouse's black-and-white day, his starring shorts having reached a zenith of expertise by a time color was initiated. Interesting to note Charlie is a street urchin here (and in another short where Bergen is a doctor). On a bonus feature somewhere there's yet another where Bergen is a dentist and Charlie is a goldbricking schoolboy. His signature costume has yet to appear. Bergen told the story of how he once planned to replace Charlie with a dummy of Esquire's mustachioed mascot, since upscale venues didn't want such a downmarket character. When a deal with the magazine fell through, he had Charlie fitted with a tux and monocle. The results were successful but odd. Charlie's basic character didn't change -- he was still usually identified as a wiseguy kid with Bergen as a parent figure. But his overtures to females (adult and, occasionally, his "own age") came off a little differently now that he looked like a miniature adult. Charlie's maturity level got blurrier as needed. W.C. Fields could spar with Charlie and even feed him to a gator. Mae West could throw loaded lines at him without violating state laws. Marilyn Monroe could appear on the radio show as his fiancee. Bergen and/or his writers were also a little conflicted on how real Charlie was supposed to be. There was a Jack Benny TV show where Jack went to visit Bergen at home, and was quietly freaked by the sight of Charlie and Mortimer trotting in and out. The somewhat disappointing payoff was Bergen revealing they were actually a couple of midgets, costumed for a gag. 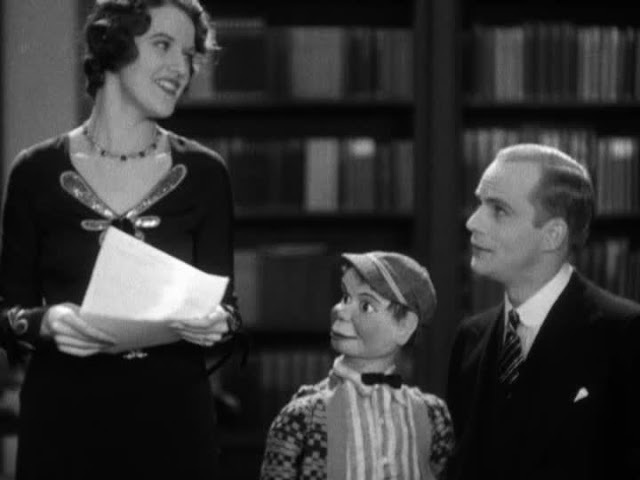 "You Can't Cheat an Honest Man" had Charlie running around under his own power, but also had Bergen playfully demonstrating ventriloquism for a young lady and sending Fields onstage with a spare dummy. I had to laugh---not in any superior way---to the old ad for "Ladies Love Brutes". That's obviously exchangeable for "Ladies Love S.O.B.s" in the parlance of a more dignified time! And, I have to say that many men would agree with that, on the evidence of what they'd seen over a lifetime, or at least I WOULD! But men who feel this way might balk if they encountered a title like "Gentlemen Love Chippies" (which I composed as an analog for this film's title; you can exchange it for something a bit more pointed, too!) One thing's certain: "Craig Loves Mary Astor"! As a young---and even older---woman, she was one in a million. She lived out her days at the nearby Motion Picture Home. I remember a pictorial about actresses of yesteryear that was run in LIFE magazine, though I forget when. Many years back. There was a picture of Astor on the grounds of the home, waving and flashing that gorgeous smile. She was grandmotherly by that time, but you could appreciate a lifetime's worth of charm and beauty in that picture. I was thrilled to be able to see an actual life mask of Astor that had miraculously survived in the old Warner Bros. makeup department. She had a surprisingly small face, and this led me to believe she must have been quite a petite. But, that would make sense, remembering her in stills from silent pictures such as "Don Juan" with Barrymore, her inamorata at the time, himself a rather diminutive man. 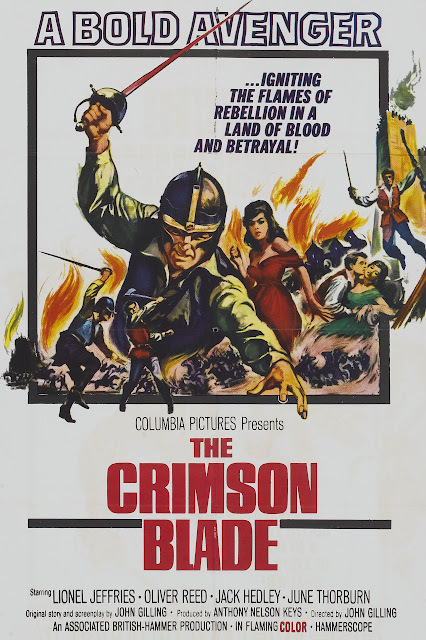 I also enjoyed seeing your review, and the poster, for "The Scarlet/Crimson Blade". I never even heard of it! Yet another Hammer by the surprisingly prolific and talented John Gilling. To think that when I was 11 and hied me off to the local theater to see "First Men In the Moon" with Lionel Jeffries, he'd also done this little number which never made it to my parts, or at least I don't think it did. I did see "The Long Ships", which he's in (in a most uncharacteristic 'look'! ), which came out about the same year I think. Busy man, that year! 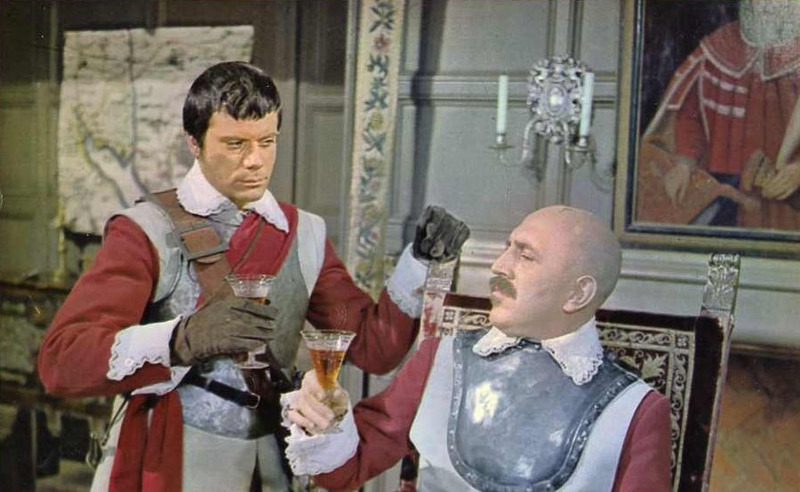 As for Oliver Reed, he was a fascinating guy. I had two friends who knew and worked with him and they loved him. They said that as far as they were concerned, the negative stories about him were exaggerated and that he was a wonderful guy. One of them, a makeup man, had gotten to know him in the '80s; the other, an actor, at the very end, during the making of "Gladiator"---and he was still emotional, remembering him. However, there's no doubt that Reed did himself in, literally, with booze. Another name that grabbed my attention was the keen actress June Thorburn, who's immortalized for me in Schneer's "3 Worlds of Gulliver", awash in effectively stretched production values, 'Technicolor', and Bernard Herrmann's luscious score. Worst luck, I'd missed "7th Voyage of Sinbad" as a boy, AND a year after "...Gulliver", "Mysterious Island", when they played the theaters. I've always regretted that. However, for some odd reason, I did see "3 Worlds of Gulliver"! And what an impression it left on me! I thought it was wonderful. I also saw "tom thumb" (it's actual title! ), but that one didn't leave nearly as deep an impression as "...Gulliver". However, the beautiful Thorburn graces each one. Ray Harryhausen thought quite highly of her, I know.